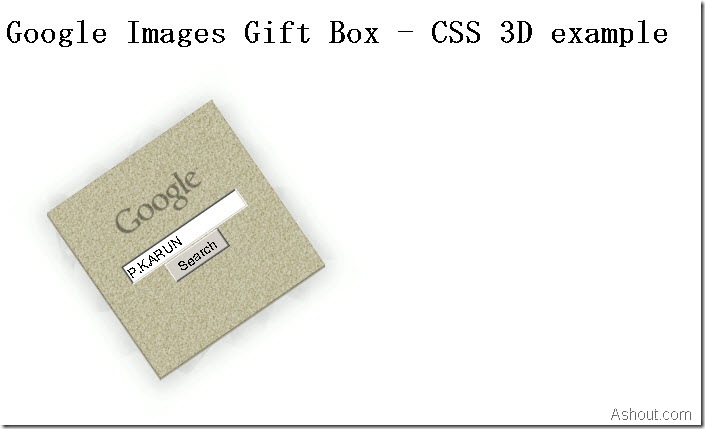 Google Images Gift Box- Google in a Box! We all use Google in a daily life, but let’s try the new way of using Google. For searching purpose we use Google.com website in the same way someone designed a new Google box which works as Google search engine but looks very nice. This Google box is built on the basis of CSS and 3D. I don’t know how it is works, it’s really a creative design. Try once, I’m sure you will defiantly enjoy it. Using Google Images Gift Box is very simple just go to http://www.addyosmani.com/resources/googlebox/ and enter any search term in the box and click search button, it will display the result which is same as in Google.com search result. The movement of Google Image box when we mouse hover on it is really cool, I enjoy doing that. He is saying that it is based on CSS 3D, I don’t know what it is, but I love it. Check once, defiantly you also fall in love with it. Similar: The Ad that made me to click 79+ clicks! !